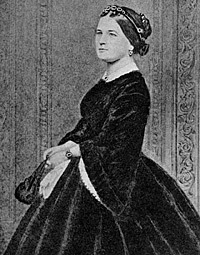 Historian Leech noted: “Two months after inauguration, she [Mary Lincoln] paid a visit to New York with Mrs. [Elizabeth] Grimsley, and purchased a solferino and gold dinner service, with the arms of the United States emblazoned on each piece. She also selected some handsome vases and mantel ornaments for the Blue and Green Rooms, and ordered a seven-hundred-piece set of Bohemian cut glass.” New York merchants welcomed these visits with open lines of credit. Mrs. Lincoln went on: “You understand, Lizabeth, that Mr. Lincoln has but little idea of the expense of a woman’s wardrobe. He glances at my rich dresses and is happy to believe that the few hundred dollars that I obtain from him supply all my wants I must dress in costly materials. The people scrutinize every article that I wear with critical curiosity. The very fact of having grown up in the West, subjects me to more searching observation. To keep up appearances, I must have money — more than Mr. Lincoln can spare for me. 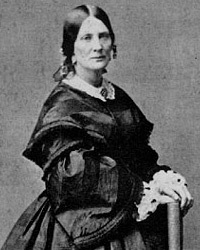 He is too honest to make a penny outside of his salary; consequently I had, and still have, no alternative but to run in debt.” This debt had been contracted despite the fact that Mrs. Lincoln had worn nothing but black from the death of her son Willie in February 1862 until January 1, 1864. After Mr. Lincoln’s assassination, Mrs. Lincoln tried a series of increasingly desperate methods to pay off her debts — including enlisting Mrs. Keckley in 1867 in a bizarre attempt to sell her clothes anonymously in New York City. Jennifer Fleischner, Mrs. Lincoln and Mrs. Keckly: The Remarkable Story of the Friendship Between a First Lady and a Former Slave, p. 197 (Although Keckly’s name has traditionally been spelled “Keckley,” Fleischner contends that “Keckly” was the spelling that Mrs. Lincoln’s seamstress and friend herself used.). Ishbel Ross, The President’s Wife: Mary Todd Lincoln, p. 126. Elizabeth Keckley, Behind the Scenes, p. 149. Margaret Leech, Reveille in Washington, p. 309-310. Jennifer Fleischner, Mrs. Lincoln and Mrs. Keckly: The Remarkable Story of the Friendship Between a First Lady and a Former Slave, p. 219. Margaret Leech, Reveille in Washington, p. 291 (New York Herald). Jean H. Baker, Mary Todd Lincoln: A Biographer, p. 232. 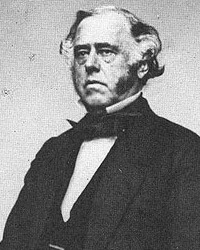 Donald B. Cole and John J. McDonough, editor, Witness to the Young Republican: A Yankee’s Journal, 1828-1870, Benjamin Brown French, p. 382. Margaret Leech, Reveille in Washington, p. 294. Jean H. Baker, Mary Todd Lincoln: A Biographer, p. 235. Elizabeth Keckley, Behind the Scenes, p. 151. Justin G. Turner and Linda Levitt Turner, editor, Mary Todd Lincoln: Her Life and Letters, p. 180-181 (Letter from Mary Todd Lincoln to Abram Wakeman, September 23, 1864). Elizabeth Keckley, Behind the Scenes, p. 147. Elizabeth Keckley, Behind the Scenes, p. 149-150. 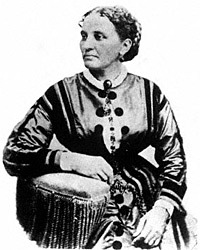 Ruth Painter Randall, Mary Lincoln: Biography of a Marriage, p. 311.